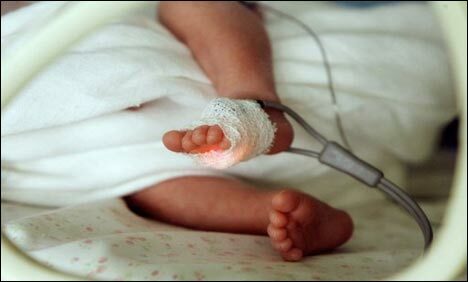 BUENOS AIRES: A premature baby who had been declared dead was found alive 12 hours later in the morgue, a health official in northeastern Argentina said. The parents of the baby, who was in serious condition, were going to name her Luciana Abigail but have changed their minds and are calling her Luz Milagros instead, her middle name being the Spanish word for "miracles." The newborn was determined to be alive after her mother insisted on seeing the body of her daughter at the Hospital Perrando, in the city of Resistencia, Rafael Sabatinelli, the health undersecretary of Chaco province, told the local press Tuesday. "At night I went with my husband to where the little box was. A man pried it open. I suddenly heard a whimper. She was all covered up and full of something that looked like frost," Analia Bouter, the baby's mother, told the local press. Sabatinelli said an investigation has been opened to determine who was responsible for mistakenly pronouncing the baby dead. Five people, including doctors and nurses, have been suspended pending the outcome of the investigation, he said.